The Yokohama Geolandar H/T-S family of Highway All-Season sport utility vehicle, pickup truck and van tires are designed to provide a combination of comfort, handling and year round traction, even in light snow. The Geolandar H/T-S family features three different All-Season tread patterns (Yokohama's G051, G052 and G053 designs) and three different internal constructions, tuned to meet three different modes of driving. Depending on the tire size selected, Geolandar H/T-S tires address the needs of light duty on-road driving (G051), make a statement for the drivers who want attention-grabbing looks (G052), or deal with the heavy loads that require Load Range E tires (G053). The Yokohama Geolandar H/T-S (G051, G052 and G053) family of Highway All-Season light truck tires each specialized for a different type of light truck use. 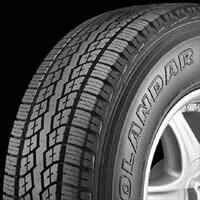 Geolandar H/T-S G053 tires are available in heavy-duty Load Range E (10-ply rated) sizes for 1-ton pickup trucks, sport utility vehicles and vans. They feature a wide, continuous center rib and a three-ply casing construction to help handle heavy loads at highway speeds. They feature raised black letter styling on both sidewalls and will be available in selected Q-speed rated, 85- and 75-series Load Range E, LT-metric sizes for 16-inch rim diameters.